Terry Halbardier, who -- as a 23-year-old seaman in 1967 -- thwarted Israeli attempts to sink the USS Liberty, died on Aug. 11 in Visalia, California. It took the U.S. government 42 years after the attack to recognize Halbardier's heroism by awarding him the Silver Star, a delay explained by Washington's determination to downplay Israeli responsibility for the 34 Americans killed and the 174 wounded. On June 8, 1967, during the Six-Day War, the Israeli military attacked the USS Liberty, an American spy ship which had been monitoring Israeli transmissions about the conflict. Intercepted Israeli communications indicated that the goal was to sink the Liberty and leave no survivors. Warplanes and torpedo boats had already killed 34 and wounded 174, when Halbardier slid over the Liberty's napalm-glazed deck to jury-rig an antenna and get an SOS off to the Sixth Fleet. The Israelis intercepted the SOS and broke off the attack immediately. In effect, Halbardier prevented the massacre of all 294 onboard. Still, the infamy of the attack on the Liberty was two-fold. First, the Liberty, a virtually defenseless intelligence collection platform prominently flying an American flag in international waters, came under deliberate attack by Israeli aircraft and three 60-ton Israeli torpedo boats off the coast of the Sinai on a cloudless June afternoon during the six-day Israeli-Arab war. Second, President Lyndon Johnson called back carrier aircraft dispatched to defend the Liberty lest Israel be embarrassed -- the start of an unconscionable cover-up, including top Navy brass, that persists to this day. Given all they have been through, the Liberty survivors and other veterans -- who joined Halbardier to celebrate his belated receipt of the Silver Star on May 27, 2009 -- can be forgiven for having doubted that the day of the hero's recognition would ever come. In the award ceremony at the Visalia (California) office of Rep. Devin Nunes, the Republican congressman pinned the Silver Star next to the Purple Heart that Halbardier found in his home mailbox three years ago. Nunes said, "The government has kept this quiet I think for too long, and I felt as my constituent he [Halbardier] needed to get recognized for the services he made to his country." Nunes got that right. Despite the many indignities the Liberty crew has been subjected to, the mood in Visalia was pronouncedly a joyous one of Better (42 years) Late Than Never. And, it did take some time for the moment to sink in: Wow, a gutsy congressman not afraid to let the truth hang out on this delicate issue. I was present that day and I could not get out of my head the contrast between this simple, uncomplicated event and the earlier rigmarole that senior Navy officers went through to pin a richly deserved Medal of Honor on another hero of that day, the Liberty's skipper, Captain William McGonagle. 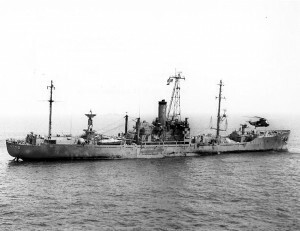 Although badly wounded by Israeli fire on June 8, 1967, McGonagle was able to keep the bombed, torpedoed, napalmed Liberty afloat and limping toward Malta, where what was left of the bodies of the 34 crewmen killed and the 174 wounded could be attended to. Do the math: yes, killed and wounded amounted to more than two-thirds of the Liberty crew of 294. 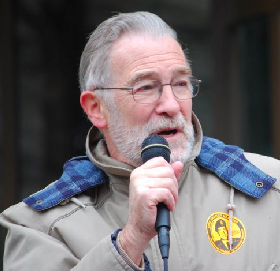 I remembered what a naval officer involved in McGonagle's award ceremony told one of the Liberty crew: "The government is pretty jumpy about Israel...the State Department even asked the Israeli ambassador if his government had any objections to McGonagle getting the medal." When McGonagle received his award, the White House (the normal venue for a Medal of Honor award) was all booked up, it seems, and President Lyndon Johnson (who would have been the usual presenter) was unavailable. So it fell to the Secretary of the Navy to sneak off to the Washington Navy Yard on the banks of the acrid Anacostia River, where he presented McGonagle with the Medal of Honor and a citation that described the attack but not the identity of the attackers. Please don't misunderstand. The Liberty crew is not big on ceremony. They are VERY-not-big on politicians who wink when Navy comrades are killed and wounded at sea. The Liberty survivors are big on getting the truth out about what actually happened on that otherwise beautiful day in June 1967. The award of the Silver Star to Terry Halbardier marked a significant step in the direction of truth telling. Halbardier said he accepted his Silver Star on behalf of the entire 294-man crew. 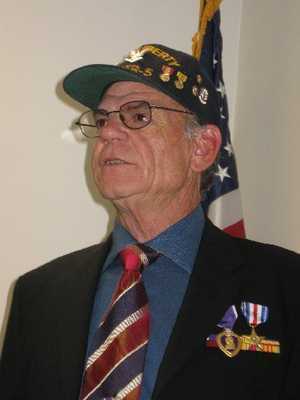 He and fellow survivor Don Pageler expressed particular satisfaction at the wording of the citation, which stated explicitly -- with none of the usual fudging -- the identity of the attackers: "The USS Liberty was attacked by Israeli aircraft and motor torpedo boats in the East Mediterranean Sea...."
In the past, official citations, like Captain McGonagle's, had avoided mentioning Israel by name when alluding to the attack. I think former U.S. Ambassador Edward Peck put it best in condemning this kind of approach as "obsequious, unctuous subservience to the peripheral interests of a foreign nation at the cost of the lives and morale of our own service members and their families." Strong words for a diplomat. But right on.